One of the first things I did when I got to NYC in August and started to unpack was to line up all of my grains and legumes in mason jars along a shelf in my apartment. I can’t tell you how much joy it gives me to walk by the queue of oats, wheatberries, barley, millet, quinoa, spelt berries, lentils, and so on; I smile every time I see them, imagining how many versatile meals will emerge from this simple array of healthful (and inexpensive) foods. Grain salads are a staple for me. They’re easy to create, filling, healthy, and they make for perfect lunch leftovers. This particular grain salad happens to be one of the best I’ve made in a long time, and I’m so glad that I put it together while zucchini was still in season. If you can remember to prepare the cashew cheese in advance (I often make a batch of the stuff over the weekend), it’s a very small amount of work for an exceedingly delicious dish. Make the cashew cheese. Place the cashews into the bowl of a food processor fitted with the S blade or a high speed blender. Add the lemon juice, nutritional yeast, garlic, sea salt, and pepper. Pulse a few times to break the cashews down. With the motor of the machine running, drizzle in the water. If you’re using a blender, increase the speed to high and blend till the cashew cheese is totally smooth, adding more water as needed. If you’re using a food processor, keep processing until the cheese has the consistency of ricotta and is quite smooth. Stop often to scrape the bowl down, and add a few more tablespoons of water if the cheese is too thick. Taste the cheese and adjust seasonings as needed. Pulse the herbs in at the very end. Preheat your oven to 400F. Place the water and the farro in a medium sized saucepan. Bring to a boil and reduce the heat to a simmer. Simmer until the farro is tender (about 30 minutes). Drain the farro well, and then allow it to cool in a large mixing bowl. You may add a drizzle of olive oil to prevent it from clumping as it cools. While the farro cooks, roast the zucchini. Toss the zucchini slices with two tablespoons of olive oil, a generous pinch of salt, and pepper to taste. Spread the zucchini on two baking sheets and roast for 15 minutes, or until the zucchini is browning and tender. 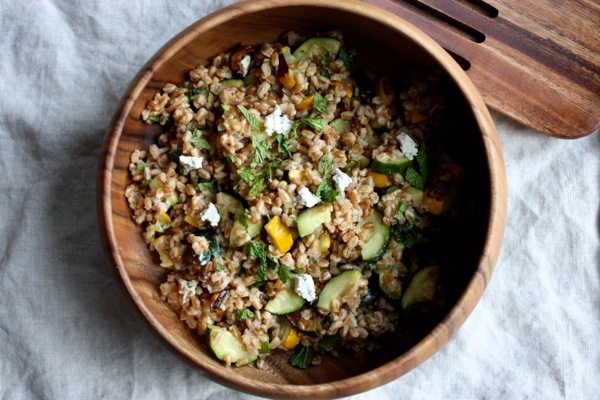 Add the zucchini to the farro, along with the lemon juice, mint, cashew cheese, and salt to taste. Toss it gently (the cashew cheese can get a little smooshed if you don't toss gingerly). Adjust all of the seasonings (you may need an extra drizzle of oil or a little more lemon). Serve. 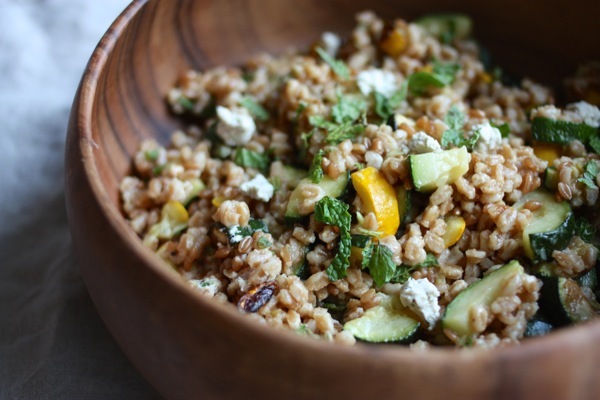 Most grain salads boast wonderful texture, but this one is particularly varied: buttery soft zucchini, chewy farro, creamy cashew cheese. 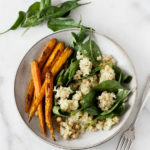 You could serve this along with a bright green salad, a summery soup (summer corn and coconut soup, easy summer gazpacho, or even one of my blended salads), a plate of roasted vegetables, or a nice slab of grilled tofu. I hope you’ll love it as much as my boyfriend and I did, when we savored each and every bite. I’m in the midst of a heavy week of nutrition counseling; I barely had a chance to breathe today in between clients! But I can’t tell you all how great it feels to be diving back into my work. It’s funny: I embarked on my post-bacc because counseling had shown me that I wanted to work with people, to help them heal. But in many ways my post-bacc pulled me away from this sense of vocation and purpose; I was so wrapped up in beating the med school odds and surviving my classes that I couldn’t direct much of my energy outward. And I had to stop taking and responding to clients because my stress levels were so high. I’m not where I thought I would be this fall, which is to say I’m not a first year med student. 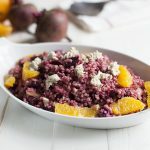 But in many ways I feel that I’ve gotten back to my original intention, which was to create a career in which I could help people to heal themselves using food as a tool. I’m as busy as I was at certain moments of my post-bacc, and I’m still putting a bunch of groundwork in place for new professional directions. But I feel more complete and more satisfied with my work than I have for a very long time. That was a random train of thought, but as I sat here at the end of a long, exhilarating work day, I had to tell you. 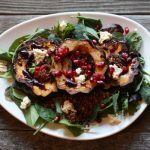 Looks like a lovely salad for autumn! Yum this recipe sounds amazing! 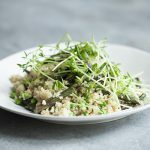 this sounds great; I only discovered farro recently, I had never seen it in the shops before. I am a fan! I’ve made this recipe quite a few times (with vegan butter) and it is delicious! 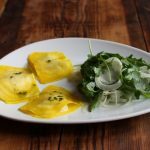 Another amazing recipe that I will have to try! what are your favourite herbs for the cheese? This recipe sounds delicious. I have 3 questions! How essential is the nutritional yeast to the cashew cheese? I have none! Do nuts/seeds get affected by sunlight? I also keep them in glass jars, but hide them away in the pantry.